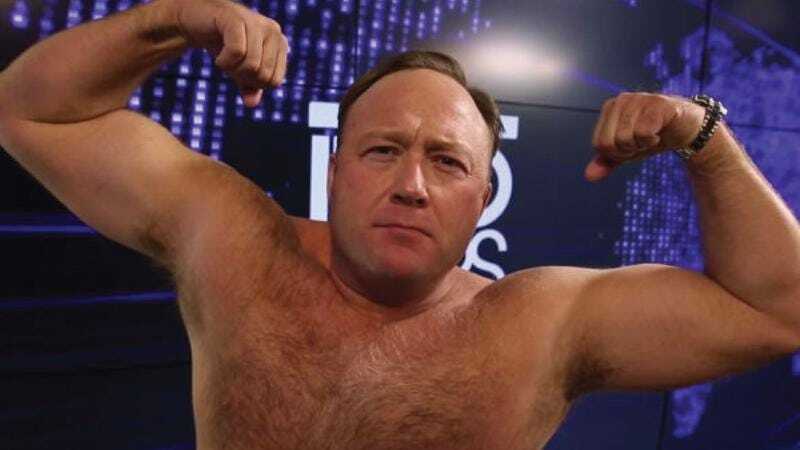 As every proud member of the resistance knows, Alex Jones and his Infowars website manages to avoid corruption from the globalist mainstream media by dint of not being subject to the elite corporatist demands of facts and evidence. Not only does that change the face of reporting, as Jones has said with little thought to the many ways that statement could be interpreted, it means his viewers can rest easy, knowing the man who looks like Kevin James after undergoing extensive cocaine therapy won’t have to kowtow to any Bilderberg stooges. To his credit, Jones has been very upfront about his reasons for appearing. “I’d be dumb if I didn’t do some of these interviews,” he says, perhaps referencing similarly dumb decisions as accusing the parents of Sandy Hook victims of being paid shills. “I know it‘s edited, I know they’re gonna attack me,” he continues, displaying the baseline cognitive reasoning that has proven so irresistible to his audience, but he felt he couldn’t say no to the opportunity. He then rails against Hollywood elites briefly, before bragging about having been at exclusive parties with Hollywood elites and dropping Brad Pitt’s name so hard it makes a small dent in the floor. He also claims his kids weren’t taken away from him, which is a weird thing to say about losing a custody battle. A few more obsessive mutterings about Hillary Clinton round it out, but all in all, it’s a sad display of cooptation by the mainstream media of a man who once had the bravery to argue that chili has memory-erasing powers. Perhaps he’s been eating more of that same dish.